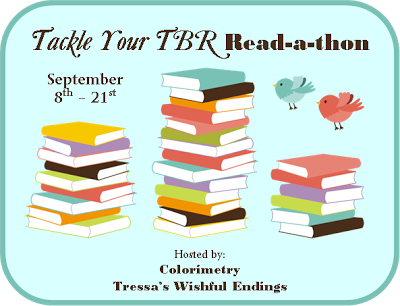 Today kicks off the 'Tackle your TBR' Read-a-thon hosted!! I am really excited about this event because I have SO MANY books I need to read! I will also be hosting a challenge with a giveaway on Friday, September 13 for participants in the Read-a-thon! If you'd like to participate (and you do NOT need to be a blogger to do so) please sign up with one of the hosts: Tressa's Wishful Endings & Colorimetry. Great books! All Our Yesterdays is on my list to. I've heard that it is great too! Thanks for joining us!